Editor's Note: We extend our deepest condolences to Karen's family. Below is our interview with Karen upon her retirement in 2015. 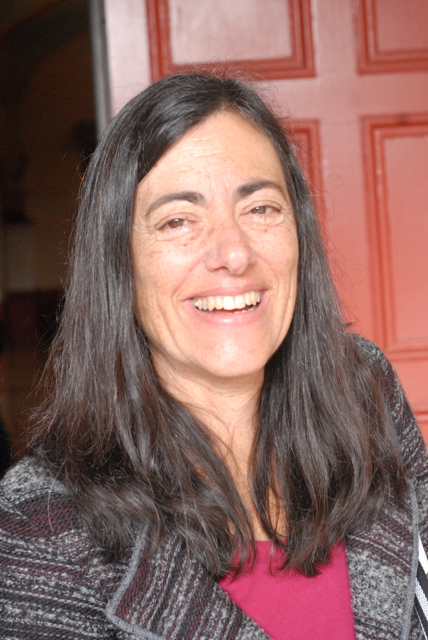 This is an exclusive interview with Karen Klonsky, UC Davis Cooperative Extension specialist emeritus, in the UC Davis Department of Agricultural and Resource Economics. Her expertise has been farm management and production, sustainable agriculture and organic agriculture. CalAgToday: Congratulations on your recent retirement! Klonsky: Thanks, Patrick. I retired on July 1, 2015, after 34 years. I started at UC Davis in ’81, straight from graduate school. CalAgToday: What has been your primary research interest? Klonsky: My primary research areas are c and organic agriculture. I have approached these subjects from several dimensions, including the economic feasibility of alternative farming practices, the size and growth of organic production in California, and factors influencing the adoption of alternative farming systems. CalAgToday: Wow, what a great career! I understand your interest in alternative farming systems began with your dissertation work comparing alfalfa systems with integrated pest management. Klonsky: I studied agricultural economics in graduate school and started working with a professor in my department who had a joint appointment in agricultural economics and entomology. And I just became very interested in that research area. 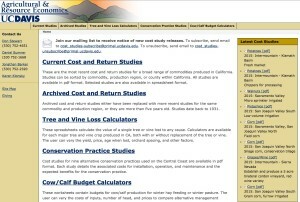 CalAgToday: Since 1983, you not only directed ongoing Cost and Return Studies, but the development of an entire archived library of Cost and Return Studies for the UC Davis Department of Agricultural and Resource Economics. You recently completed studies on pistachios and walnuts, right? Our library contains studies about field, tree and vine crops and animal commodities. But since I retired, Dan Sumner, director, University of California Agricultural Issues Center and Frank H. Buck, Jr. Distinguished Professor for the Department of Agricultural and Resource Economics has taken that over and I continue to be peripherally involved. CalAgToday: These cost studies have been recognized worldwide. Klonsky: Yes, and it has been very gratifying work. We decided to put them online routinely, and we have had a million downloads per year. Around 2005, Pete Livingston, my staff research associate, got the idea of scanning in the older studies. All of the newer studies were in electronic file format, so posting was easy. However, most of the older studies were paper copies, so we got a grant to scan and add them to our new online archive. CalAgToday: What was the most interesting thing about doing those cost studies? Klonsky: I loved doing those studies. I really learned a lot because all cost studies are done directly with farmers we met through county farm advisors. I really got to know what farmers were thinking about and what their options were. CalAgToday: So those were real costs, not university costs? Klonsky: Those were not university costs. The farmers tell us what equipment they will use, and then we calculate the cost of using their equipment—the fuel used to operate the equipment and the repair costs—with an agriculture-engineering program. CalAgToday: Do you have a math background? Klonsky: Yes, I got my bachelor's at the University of Michigan in mathematics. It was very helpful. CalAgToday: And you also earned your Ph.D. at the University of Michigan? CalAgToday: So did you grow up in Michigan? Klonsky: No, I grew up in New York. CalAgToday: And you had an interest in going to Michigan State University? Klonsky: I had an interest in agriculture because I had an uncle who farmed corn and vegetables in upstate New York. We would go up there and I thought it was the most wonderful thing in the world. CalAgToday: What were some of the highlights of your career? Klonsky: For many, many years, I was involved in the long-term on-campus sustainable agriculture research on land that is now on Russell Ranch, but it started as Sustainable Ag Farming Systems. We looked at four different farming systems, organic, low input, high-input, and we did a lot of analyses with cover crops and rotations. It was great to work on that project. CalAgToday: And you worked with USDA on the trends of organic farms? Klonsky: Then I worked quite a bit with Department of Food and Agriculture on using the registration data for their organic farmers to compile statistics about how many farmers they had, what they grew, and the number of acres they planted with each crop. They had this database, which started in 1992 I believe, but they weren’t using it. Now the most recent registration analysis is available for 2012. CalAgToday: Just to try to get more data on the organic movement and organic growth? Klonsky: Yes, because there was no data at all about it. Now NASS (National Agriculture Statistics Service) conducts a nationwide Organic Census, in addition to the regular Census of Agriculture. CalAgToday: I understand you served as an editor of the Journal of American Society of Farm Managers and Rural Appraisers (ASFMRA). What did that entail? Klonsky: Yes. I did that for many years. ASFMRA is a national organization. The Journal of the ASFMRA comes out annually. As editor, I corresponded with the authors, assigned reviewers, and ultimately, accepted or rejected submissions, like any journal. CalAgToday: Did you travel a lot with your work and presentations? Klonsky: You know, not so much, I went to Spain one time and France once for work. But I did travel around domestically to symposiums and conferences to speak on the economics of growing a lot of different crops, including many presentations at the EcoFarm Conference. CalAgToday: You worked and collaborated with some really interesting people. Klonsky: Most of my important collaborations were conducting trials with people in other disciplines. For instance, at Russell Ranch, I was the only economist involved in the collaboration with plant pathologists and pomologists who ran trials to discover fumigation alternatives in the preplanting of trees. Then I worked with people at UC Santa Cruz on alternatives for strawberry fumigation. Most of my work has been interdisciplinary. CalAgToday: California farming is a tremendously diverse industry. We produce 60% of the fruits and vegetables, and nearly 100 percent of the nut crops that people across the country consume. Any comments on that and on how, valiant and resilient farmers are to get through year after year, particularly lately with the drought and the lack of water deliveries? Klonsky: When I first started, there was a land price bubble, and there were a lot of bankruptcies because people had these land payments they just couldn’t pay. It was kind of like the mortgage crisis that housing saw in 2008, agriculture saw in the early 80s. CalAgToday: So as you have been editor for the Journal of the American Society of Farm Managers and Rural Appraisers, you see land values going up and that keeps agriculture strong—the high land values, right? Klonsky: Well, but it keeps it expensive. So now there is more and more leasing of land. As farmers retire from permanent crops, they have an orchard, but they don’t really want to sell it, so they lease it. CalAgToday: There you go. Keep it somehow in the family. Klonsky: Yes, they try to keep ownership in the family. Or what we see also are these development leases where a young farmer can’t afford to buy the land, so they lease the land, but they pay for the trees to be planted. CalAgToday: So you are still coming to your office at UC Davis? Klonsky: I am officially retired, but we have what we call a ‘partial recall’ where you can do things if you have funding. I have a project along with Rachel Goodhue, Professor, UC Davis Department of Agricultural and Resource Economics, with the California Department of Food and Agriculture, funded through the California Department of Pesticide Regulation. The Department of Pesticide Regulations is required by law to do an economic analysis of all proposed new regulations. So that is what I am working on. CalAgToday: Give me a couple of examples. VOC regulations? Klonsky: Yeah, we do VOC. CalAgToday: Are you looking at sustainable groundwater legislation? Klonsky: No, just pesticide regulation. It is funded by the Mill tax on pesticides. CalAgToday: Did you work with a lot of graduate students at UC Davis? Klonsky: Oh yeah, I worked with a lot of graduate students coming through. One of them was on different ways of pesticide management on eucalyptus trees. I said I went to Spain. On that trip, I spoke about growing eucalyptus for firewood. CalAgToday: That was an economic study, wasn’t it? Klonsky: Yes it was. They grow it not for firewood, but for paper. But that never really caught on here. CalAgToday: Are you bullish on agriculture? Do you think Ag is going to continue thriving in California? Klonsky: Oh, sure. Oh, sure. But I think that the water situation is definitely real, and I think agriculture already has definitely made tremendous strides in irrigation systems, especially the subsurface irrigation in vegetables, in particular processing tomatoes, which I worked on. CalAgToday: That was a huge improvement in growing tomatoes. And people didn’t think it was going to work, but it turned out to be fantastic. Klonsky: Yeah, a really win-win on that one. And orchards are getting more efficient. If you look at the water per pound of crop produced, you see major improvements with water efficiency. CalAgToday: Absolutely. Of course, most plants transpire most of the water they take up through the roots, up through the leaves and the stomata cells. By the way, do you have any interesting stories regarding your career? Klonsky: It’s not the highlight, but the weirdest thing of my career is I got an email from somebody in Ministry of Agriculture and Fisheries from the United Arab Emirates. They wanted me to give a live presentation about Cooperative Extension in California and how it’s organized. So I had to go to this office building in downtown Sacramento at 10:00 at night because of the time difference. I went into a conference room that had a special kind of projector so I could see them and they could see me. And on the monitor I see all these men walked in—they were all men—and half of them were in Western dress and half of them were wearing a Sheik-like headdress, with a band that sits on top and holds it on. That was crazy, just being downtown after everybody is gone and the whole building was dark and quiet, except the one room that I was in. CalAgToday: How long was the presentation? Klonsky: Gosh, maybe an hour. CalAgToday: You needed to do some research for that presentation? Klonsky: Yeah, I had to do some research, I had to think about Cooperative Extension in a different way—the big picture. CalAgToday: Keep up the good work, and I hope you are enjoying retirement. Klonsky: Yeah, I come in two days a week, so it is nice to see everybody. I still get a lot of emails, which I need to answer.